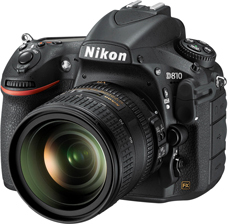 TOKYO - Nikon Corporation is pleased to announce the release of the D810, a Nikon FX-format digital SLR camera. *Except where noted, all specifications provided apply to use at an ambient temperature of 23° C (± 3° C) with a fully charged battery, in accordance with Camera & Imaging Products Association (CIPA) standards. *Products, brand names and service names are trademarks or registered trademarks of their respective companies.